Share This started out as an idea in September 2011 as a way to document and share content from the Social Summer series organised by the Social Media Panel at the CIPR in the UK. Gemma Griffiths and Philip Sheldrake were instrumental in kickstarting these sessions during which practitioners would lead evening workshops at the CIPR in London each week, exploring emerging areas of public relations practice. The Social Summer is now in its fourth year and has spun off events around the UK, organised by CIPR regional groups. Share This was pitched to Wiley as a series of 26 essays covering eight areas: the media and public relations industry; planning; social networks; online media relations; monitoring and measurement; skills; industry change; and the future of the industry. Wiley bought the idea, partly because it was contemporaneous, but mainly thanks to Philip Sheldrake, whose book the Business of Influence, was enjoying great success. Share This came together quickly. Contributors generously gave their time to write a practical 3,000 word essay about an emerging area of public relations. The CIPR owes its thanks to authors Katy Howell, Simon Sanders, Andrew Smith, Helen Nowicka, Gemma Griffiths, Becky McMichael, Robin Wilson, Alex Lacey, Matt Appleby, Dan Tyte, Stuart Bruce, Rob Brown, Russell Goldsmith, Adam Parker, Julio Romo, Philip Sheldrake, Richard Bagnall, Daljit Bhurji, Richard Bailey, Rachel Miller, Mark Pack, and Simon Collister. Share This was published in July last year. We secured endorsements from business people including Lord Sugar thanks to the connections and influence of Russell Goldsmith and Andrew Bloch. The book has sold well and has gathered an audience around the world. It turns out that books are an excellent way to communicate with marketing and public relations practitioners. At the launch of Share This at Google in London last year, I suggested that we would consider producing another book, providing there was sufficient interest, because there were so many topics that we had to leave out of the first book. Rob Brown proposed the title Share This Too and people quickly lined-up to contribute content. Almost all of the original authors offered to write content and some new contributors signed-up. A proposal was turned around quickly for Wiley with a line-up of contributions including myself, Rob Brown, Dom Burch, Robin Wilson, Ged Carroll, Kate Matlock, Adam Parker, Mark Pack, Sharon O’Dea, Paul Fabretti, Michael Litman, Russell Goldsmith, Stephen Davies, Scott Seaborn, Dan Tyte, Matt Appleby, Kevin Ruck, Hanna Basha, Chris Norton, Becky McMichael, Rachel Miller, Stuart Bruce, Richard Bailey, Jane Wilson, Juilo Romo, Jed Hallam, Katy Howell, Gemma Griffiths, Philip Sheldrake, Richard Bagnall, Drew Benvie, Andrew Bruce, and Simon Collister. Rob Brown offered to join me in coordinating the project and editing the book. Paul Fabretti persuaded Brian Solis to contribute the foreword. The book was developed - like Share This - using social techniques. Authors contributed content via a cloud-based service and reviewed each other’s work. It brought a level of discipline and quality to the project that has resulted in a fantastic end product. Phil Morgan, Andy Ross and Kim Roberts at the CIPR all gave their time willingly, way beyond the call of duty, to ensure that we kept to deadlines. 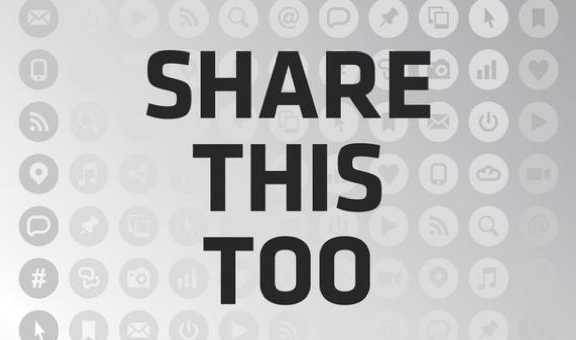 On Monday evening at the British Library in London we'll celebrate the work of everyone that has contributed to the project at a party for the launch of Share This Too. Precise has kindly agreed to sponsor the event. Share This Too is available to buy on Amazon and in bookstores worldwide. If you're an academic, blogger or journalist and are interested in a review copy please contact Andy Ross (@AJMRoss) at the CIPR. The authors will be taking part in events around the country, and further afield, over the next 12-months starting with Social Media Week London. And there's a Twitter feed and a Pinterest board of course. Rob and I have a couple of spare tickets for Monday evening if you fancy coming along as our guests. Leave a comment below or give us a shout via Twitter. First come, first served.